The Website@School Project is proud to announce that, after a long time of dedicated development, the first official version -- Website@School 1.0.0 -- was released to the world on June 29, 2016. Website@School provides the basic features, such as a Page Manager, a File Manager and an Account Manager. Extra functionality is added via modules. Currently 12 different modules are available, including a Newsletter module, a Snapshots module and a Weblog module. The general look and feel of a website created with Website@School is provided via themes. Currently there are 7 themes to choose from, including the new responsive theme Ruta. These themes can be adapted using Bazaar Style Stylesheets (BSSS) to create very different looks from the same underlying theme. The looks of the administrative interface are also configurable: there is a choice of 5 different skins, some of which are created specifically for blind and visually impaired webmasters. The program is translated into more than 25 languages. The Website@School Users' Guide documents all features, modules, themes and other details. It is illustrated with almost 500 screenshots. Let me take this opportunity to cordially thank all program translators, manual translators, code contributors, graphics artists, testers, users and others that are somehow connected to the Website@School project for all their efforts, feedback and support. Without your help Website@School 1.0.0 would never have seen the light of day. It is very sad that Dirk Schouten didn't live to see this first official release of Website@School. Therefore we dedicate Website@School 1.0.0 to his memory. Please, enjoy the first official release of Website@School. Your comments, questions and other feedback are very welcome at websiteatschool.eu/index.php/55/Contact.html or send an e-mail to <info (at) websiteatschool (dot) eu>. We are very sorry to report that the Website@School Project Leader, Dirk Schouten, passed away on June 29, 2015, after a short illness. For many years Dirk has devoted virtually all of his time and energy to the project: dreaming up ideas for new modules, finding donors for funding, coordinating translator activities, and writing the comprehensive Website@School manual. His efforts were recognised when he was appointed Member in the Order of Orange-Nassau by her Majesty the Queen of The Netherlands in 2012. Dirk was and will remain an inspiration to us all. He will be greatly missed. Her Majesty the Queen of the Netherlands has been graciously pleased to give a Royal decoration to the Website@School team. 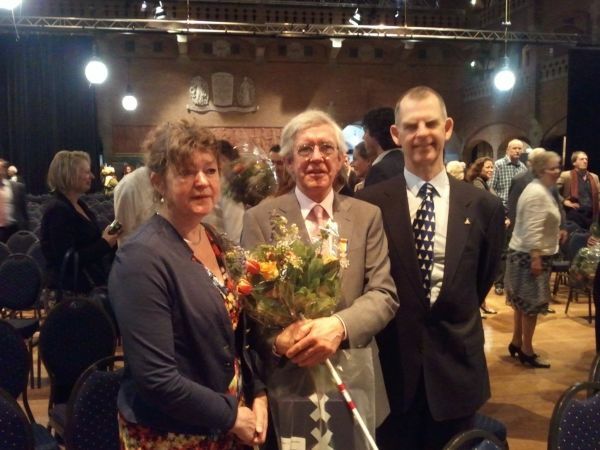 We were honored with the membership in the Order of Oranje Nassau. The core team: Karin Abma (ICT coordinator public primary school Rosa Boekdrukker), Dirk Schouten (project coordinator, manual writer) and Peter Fokker (main developer) after the ceremony. This decoration is a reward for all volunteers and donors that made Website@School available for pupils, teachers, parents and schools in so many countries. Thank you all!